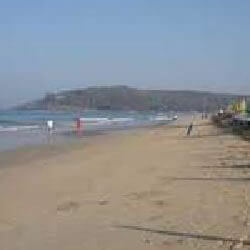 Calangute beach, set with the backdrop of the Arabian Sea, is truly named the “Queen of the Beaches”. Surrounded by palm and coconut trees, the beach of Calangute was once a busy fishing village. Today, Calangute is one of the most popular and busiest beaches of Goa. The beach of Calangute is the perfect place for indulging in any kind of water sports and beach activities..
Before the fort was built by the Portuguese, this fort was in Goa, even before their arrival. The beautiful Divar Island that is rarely visited is situated across the Mandovi River from Old Goa. 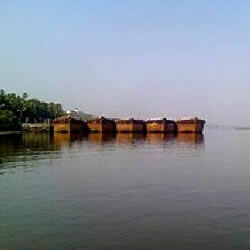 A ferry connects the southern end of the island with Old Goa. The ferry wharf is situated near the Viceroys Arch at Old Goa. Another ferry links the . 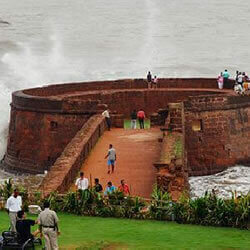 The Fort Aguada is one of the largest and impressive forts preserved as one of the best known landmarks in Goan history. Its prominence has grown from the fact that its headland on which it is built offers a wonderful site for military architecture. 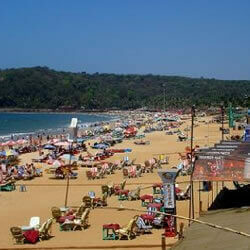 Goa Baga beach is an option for those who want to be away from the hustle and bustle found on the other beaches. Baga Beach in Goa looks as if it has come straight out of a painting… Majestic white waves rushing to wipe out the feet imprints. The Anjuna beach in Goa is known for its full-moon (acid house) parties. Held for and by young tourists, these parties have attracted thousands of tourists. The trance party with dance, frolic, and merriment goes on all night beside the fire. Every Wednesday a flea market is held at Anjuna beach. 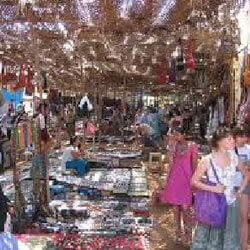 This market is very popular among the tourists and is big and spread over the Anjuna coast line where everything under the sun can be found.The origins of the Flea market are dedicated to the Hipp. Casinos in Goa are an integral part of the nightlife in Goa. 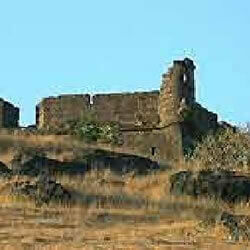 They are not unique to Goa and have been started to promote tourism in the state. 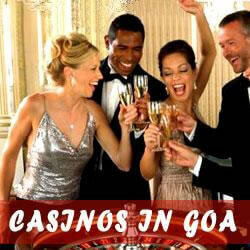 Infact Goa is now known to be a home for some of the finest casinos in India that offer the best of casino gaming. 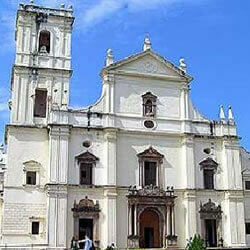 The convent and church of St. Francis of Assisi is situated at Old Goa. Originally this church and surrounded convent was founded by Eight Franciscan, who arrived in the year 1517, during the Portuguese rule. 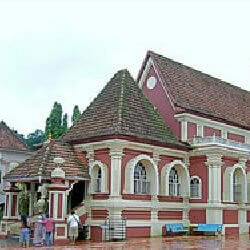 The Mangueshi Temple is situated 22 kms from Panaji (26 kms. from Margao) at Priol in the Ponda Taluka. 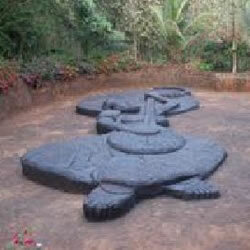 It is dedicated to Lord Mangueshi, a form of Shiva, which is recognised only in Goa. Perched on the lofty peaks of the Western Ghats, the Dudh Sagar waterfalls offer unrivalled beauty, and amazing scenery full of exquisite charms when in full flux after the monsoon showers. The Dudh Sagar waterfalls, which from a distance appear like milky streams, gradually climax into a gushing cascade as they come into full view of the onlookers. . The frilly movements of the sea appear as if the sea is lazily enjoying the tickling sensations spread by the waves riding over it. 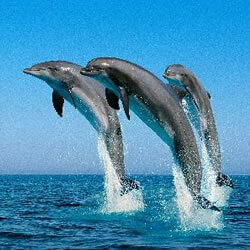 This is how you can describe the sea at Colva beach. Colva Beach is one of the finest beaches in Goa, India. The white sands of Colva Beach is soft and fine, ideal to walk barefoot anytime day or night. 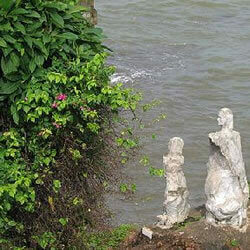 Colva beach is the pride of Salcete and the only rival to Calangute by its scenic splendour. A vintage reproduction of Goa - as it existed under the colonial ambiance yet still retaining a checkered flavour of originality. 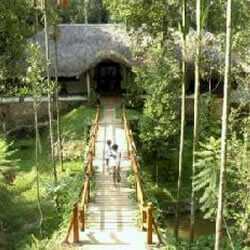 Ancestral Goa - a museum of a mock - up village flanked by lush parkland, welcomes you to Big Foot. Major spice plantations that produce exotic spices Sahakari Spice Farm Located at a distance of just 2 kilometers from Ponda, the Sahakari spice plantation is famous for its farms and grows many fruits. One of the most unique spices grown here is vanilla. The farm is spread over 130 acres and also has two small streams flowing right through. 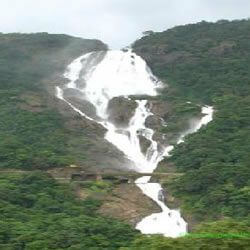 This spice plantation is located on high mountains amidst stunning surroundings near Ponda. Many tourists visit the Abyss spice plantation as it is famous for the medicinal herbs that are grown over here on a large scale. Savoi Spice Plantation This spice plantation is located at a distance of around 10 kilometers from Ponda. The main spices grown here are cinnamon, cloves, cardamom, turmeric, ginger, basil, nutmeg and pepper plantations. The cashew distillation unit is an added attraction here. 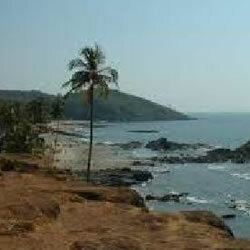 A secluded bay situated on the Arabian Sea, the Dona Paula Beach is one of the most sought after beaches in Goa. A meeting point of the Zuari and Mandov rivers the Dona Paula Beach. An ideal holiday spot for tourists and locals alike this beach is also known as the Lovers Paradise. Named after the daughter of one of the viceroy’s of India Dona Paula de Menzes, who jumped off the cliff because she was not permitted to marry a local fisherman, this beach is haunted by mysticism and divine beauty. Dolphin watching trips consists of a brief glance of a rather timid than playful creature, and to get a photograph you have to be more lucky than skillful. Take a Fishing Boat Trip and watch the dolphins feeding in the early morning as watching these graceful creatures in their natural habitat is a great delight. 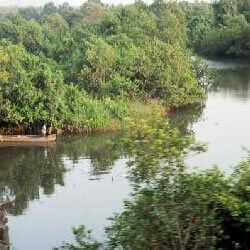 One can also take a trip up the river to see the crocodiles in the back waters and mangrove swamps. Crocodile spotting in Goa carries with it a notion of adventure. You can thrive in the glory of pure natural beauty that surrounds you. 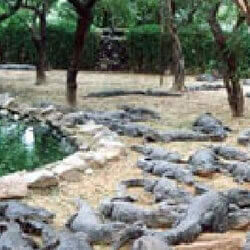 A crocodile spotting tour in Goa often doubles up as a river cruise through the rivers of the state. 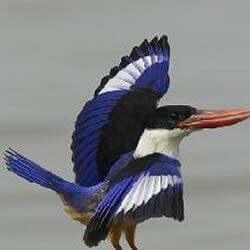 One of the smallest bird sanctuaries, Dr. Salim Ali Bird sanctuary has been named after India's renowned ornithologist. This sanctuary is spread over an area of merely 1.8 square kilometers. Though small, the sanctuary homes around 400 species of birds, both local and migratory. Experience the goodness of Goa. Explore the absolute virgin unexplored pristine, tranquil backwaters with excellent food, fresh seafood and a variety of other Goan dishes that we have selected especially for you.